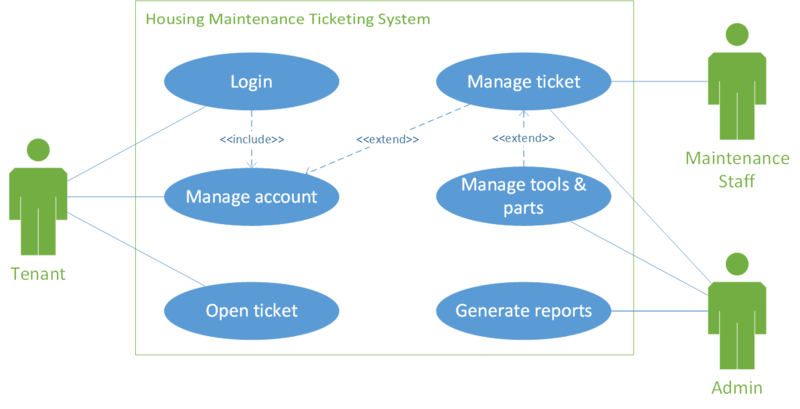 Housing Maintenance Ticketing System. The purpose of this document is to lay out the system's functionality. Including functional and non-functional requirements, use cases and wireframes. This section shows the system's main functional requirements. This sections shows the system's non-functional requirements and their corresponding areas. Create a user manual for the Tenant, Admin and Maintenance Staff. Data should be backed up weekly on a cloud storage service provider. Generated reports should be compatible with Microsoft Excel. Web solution should be updated at least once a year to maintain compatibility with platform as a service provider. CRUD ticket operations should happen within two (2) seconds. Web solution availability should be 99.9%. Client/Server communication should be encrypted. This section shows the general use case diagram and a Cockburn's casual descriptions for two of the main use cases. Cockburn's casual description for the open ticket use case. Tenant. Admin and Maintenance Staff are secondary actors for this use case. Tenant creates a maintenance ticket. Tenant selects 'Subject' from a list of possible issues. If the subject is not found in the list, Tenant can select 'Other' and explain the issue in the ticket's description. Tenant receives a confirmation message with a ticket number. Tenant receives an email with the content of the opened ticket. Cockburn's casual description for the manage ticket use case. Admin. Maintenance Staff is secondary actor for this use case. Admin can inspect the content of the ticket by clicking on one. Admin can perform three tasks related to each ticket 'Update', 'Reply' and 'Close'. Admin updates ticket status from a drop down list. Options available are 'Pending', 'Assigned' and 'Solved'. Admin assigns ticket to maintenance staff user. This section shows four (2) wireframes for the main four use cases of the system.